As rice and fish are main staples in Bangladesh and east India, the people in this region have developed effective ways to use the different parts of a fish in their culinary delicacies. The fish in Mung daal is one such preparation, where the fish bones and head are used for a surprising result. With its earthy aroma and mouth watering taste, sometimes referred to as Moori-ghonto, this dish is usually cooked during festive occasions. Large mature fishes, called paka maach in Bengali, are usually selected for cooking. The bones and fat in the developed fish add to the flavor. For this recipe, we have used a head of a Salmon. 1. In step one, the roasted Mung bean will be half boiled. 2. The fish head will be marinated with salt and turmeric powder and then shallow fried in oil. 3. Next, the onion will be sauted with spices and fried fish bones. 4. And finally, the fried spicy fish bone will be added to the Mung daal and cooked to completion. 1. 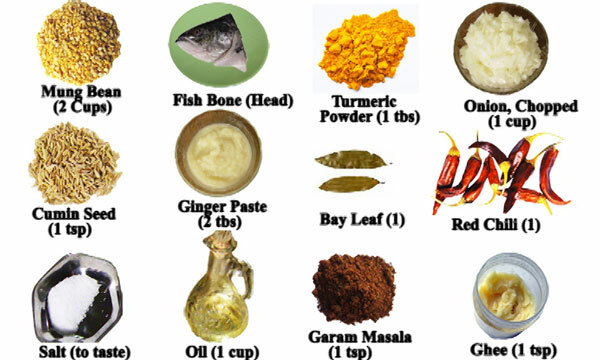 Sprinkle turmeric and salt on the fish head and marinate uniformly all over. 3. Measure 2 cups of split Mung bean in a moderately hot pan, and roast it till it becomes golden yellow in color. 4. Then carefully add 4 cups of water. Take precaution as the water will create lots of steam.5. Boil the mixture for about 10 to 15 minutes or until the Mung bean becomes half-cooked or semi-soft6. Set it aside. 7. Add 2-3 table spoon of oil into a moderately hot pan. 8. When the oil is hot to touch, add the fish head and fry on all sides for about 3-4 minutes. 9. You may want to cover the pan if it splatters. 10. Break the fried piece into smaller parts. 11. And fry uniformly all over. 13. Heat about 2-3 table spoons of fresh oil (or use the left over oil from frying the fish). 14. Add the chopped onion and grated ginger to the oil; if you so wish, you may add the ginger after the onion is half fried. 15. Fry the mixture till the onion become golden yellow. 16. Add a spoon of turmeric powder. 17. Add a table spoon salt. 18. And fry the mixture till the onion becomes yellow brown. 19. Add the fried fish bone. 20. Stir for another minute or so. 21. Then add the mixture to the half boiled Mung daal completed previously. 22. Boil for the next 25 to 30 minutes or until the Mung bean is soft. 23. In a separate moderately hot pan add one table spoon of oil. 24. When it is hot to the touch, add one long Indian bay leaf. 26. Then add 1 dry red chili. 27. And 1 table spoon of the cumin seed. 29. When the cumin seed starts sizzling, add this spice mixture to Mung daal pot as well. 30. Bring the whole mixture to a boil and boil it till it becomes of right consistency. 31. Remove it from the heat. 32. Add 1 tea spoon of garam masala. 34. Then 1 tea spoon of the ghee or clarified butter. This will add a unique buttery taste to the daal. 35. This completes the Mung daal with fish bone. Serve the daal with rice or chapatti. Or by itself as a delicious soup.